Johny Walker and Mehmood in-fact were not only mere comedians as labeled by the fraternity of our film industry but have on several occasions have proved beyond doubt of being the main supporting actors in many films. Above all these 2 greats on several occasions have been better of than the leading actors and have equally shouldered the responsibility in making many films great hits. Mehmood the other great amongst his contemporaries had created various films like Bhoot Bangla, Kunwara Baap, Mastana and the very big hit Bombay to Goa, in which the super star Amitabh Bachan was indeed given the required break. Mehmood was also instrumental in giving the required break to R D Burman in Bhoot Bangla. Mehmood and his entire family comprising of his father Mumtaz Ali, brother Anwar Ali, sister Minoo Mumtaz and his sons Lucky & Plucky has served the industry for several years. In the loving memory of Johny Walker and Mehmood I have today selected a few of the songs which none other than the Greatest Ever Mohammed Rafi Saab has rendered. May the souls of all these Greats rest in eternal peace!!! This entry was posted on Sunday, February 22nd, 2009 at 1:17 pm	and is filed under Meri Awaaz Suno. You can follow any responses to this entry through the RSS 2.0 feed. You can leave a response, or trackback from your own site. what a unbelievable singings of rafi sahab for johny walker and mahemood …great….. This song is from film “MADHUMATI”, not from PYASA as indicated in the list. Like millions am also a great fan of Mohammed Rafi Saheb. It is joyful to hear his songs take any of them they are pure and most touching satisfaction to the true music lover is certain. I want feed back from other Rafi saheb lover also in this regard. He is gem of man no doubt but what make him to sing so perfectly (when this word perfectly come i would like to add great Lata Manageshkar also. They both are perfect no doubt. and ‘ suno suno miss chaterjee’ very much. Here is the you tube link for Suno Suno. Hilarious and so light hearted. nice article . rafi saheb was specific for Jhoney Walker and Mehmood. they were the first and last comedians of Hindi Cinema who got the title of Second Hero with the vocal Rafi Saheb. They also became the solo heros in films like Jhoney Walker and Shabnaam where Rafi Saheb lent his golden voice for them. The rafi gems picturised on both of them are outstanding. Rafi saab could sing any type of song.Why? We all fail to realise the true reason. Is it just sheer talent? No the main reason according to me is that he was a very innocent person with a clean and pure heart.Only such kind of people can switch on to any mood without any inhibitions.This is clearly reflected in on song of Mehmood which is missed.The song is from the film Pathhar Ke Sanam.He sings in a style where Mehmood is not clear in his speech.Rafi saab could do so not only because of his talent but because of his simple heartedness . Maine Kaha tha Aane Sunday AND the other one – Mere dil ko jiski Talaash – both sung by Rafi Saab & Ashs,there are other numerous songs sung by Badshah for Johny Walker from `PEHLI RAAT`,`DOOR KI AWAAZ`,which i will quoting in my subsequent mails. The stantza ‘mere maula’ is sung by Rafi saab only. He has changed his tone to suit the situation. Something similar can be found in the song ‘Kya teri mehfil hi sanam kho gaye hum allah ki kasam,’ from the movie China Town & picturised on Shammi Kapoor. When Rafi Sb sings for Comedians then it seems like so original. 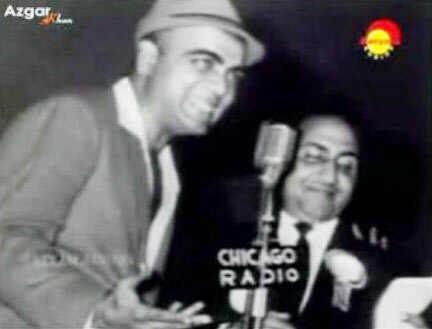 For Mehmood he sung one of my favorite song “Illahi Tu Sun Le Hamari Dua” from movie Chote Nawab. For Jhony Walker he sung “Tirchi Nazar Se Yun Na Dekh” from movie Ek Phool Char Kaante is also my favorite one. “Tu hai jani mera me hun Jania Teri” is also starred by Mehmood. Rafi Sb had a great quality to sing comedy songs as well as like other songs of all categories. Rafi Sb is really a genius who can sing all types of songs. dear devdata, the song ..jungle mai more nacha… is not in the filim pyassa , it is in the filim madhu madi sung by rafi sab under the baton of salil chaudari.another good song sung by rafi for johney is ambi agar bache hote nam hamare hahblu kubulu..md ravi and filim? “Gungarva mora cham cham baje” is from the film “Zindagi” and rendered by Rafi saab and Asha bhosle..
Hello Devdata Sb, Thanks a lot for this article and a list of great songs of the legendary. You mentioned one of my favorite song: Yeh duniya gol hai	from Chaudhvin Ka Chand. I am a little bit confused about the last stanza of the song where Jhony changes his song after looking at police man to “Meray Maula Bulay Lay Madeenay” I am confused if these lines are sung by Rafi sb or Jhony himself. The names of Johny Walker and Rafi Saab are synonymous and complimentary to each other. According to me Johny Walker had more attraction because of songs he sang on the screen and for that purpose the contributions made by Rafi Saab was more important. It was still more amazing that Rafi Saab sang all those songs in different styles suited for the situations. This was rare Godâ€™s gift bestowed on him. Mr. Devdatta P. Bijoor has done wonderful job by bringing to our attention citing few songs, but large numbers of best songs in duet as well are left out. Of course if one wants to cite all songs the list will be huge. Thanks to Mr. Devdatta P. Bijoor for nostalgically taking us to wonderful past of these duos.